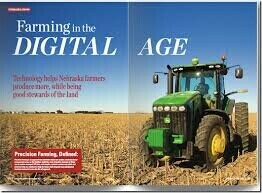 At the era of digital farming, we all were living in a digital simulation in a sense that reality is only virtual. Anything that we saw or felt was not like it was appear as we were looking the situation under the perspective of Planck time or length. Hence digital farming is representing all the complex reality in terms of all its physical and chemical laws in which it will represented by the binary digits to demonstrate and manage all the complex interaction all at once in a moment. Since this current state of the art make these authors to see what would be the best combination agricultural practices that would feet to a certain locality for a certain period of time to make the best out of any possible scenarios of sorghum production in Ethiopia. In the recent paper by author F. Getachew et.al, the concept of digital farming was superimposed over the prevailing climatic condition in different agroecology zones of Ethiopia and make the best bet combination of technological packages to improve the sorghum production in each respective sorghum growing belts. The Climate and Geospatial Research Directorate (CGRD) is one of the key research program of The Ethiopian Institute of Agricultural Research (EIAR) to address the challenges associated with major climatic features. CGRD is committed to undertake research that enhances climate resilient agriculture through the provision of climate services required at all scales of interventions, including farm and policy levels with the implementation of geo-spatial science and technology as a research, planning and decision support tool and provide spatial data, synthesized information and knowledge.